The ghostly black dogs of Britain are a well known example of this strange phenomena. Ask any crank medium and they will happily tell you that not only do animals have souls but they also have ghosts. I've often wondered if these mediums are thus vegan, or at least vegetarian, as I would find it somewhat perplexing to think they eat meat of an animal they believe to have an eternal soul. But it's not just them who believe it. In 1815 there is a report of a ghostly bear being seen in the Tower of London (the former Royal Menagerie) by a guard who promptly attempted to bayonet it. However given that the story seems to be a mish mash of a couple of different Anne Boleyn ghostly encounters at the Tower I suspect this story is nothing but bunk. In fact I think I might be on to something; ghost cats are everywhere. Here for instance. Then we have this rather creepy story. I've always been a cat person and I'm never surprised at the lengths my cats will go to to return home (my old cat Millie once returned to our previous house and waited outside for two weeks before realising we really weren't coming back so walked the ten miles back to our new house and settled in). But if my dead cat came back and meowed outside my window every night and then appeared on my bed with the injuries sustained before death being visible I would not be best pleased. 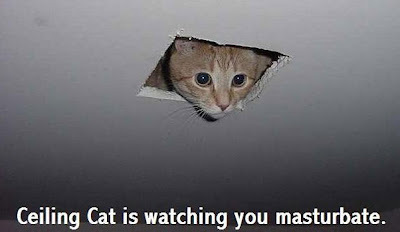 You thought Ceiling Cat was just an amusing internet meme? Think again, she's actually an unhappy cat soul. Myspace can be blamed for many things but I think we can discount it as having too much of an influence in this story. Plenty more dog and cat stories here. In a twist on the usual story we have the demonic return of a pet pig... just what is it with all these creepy things having red eyes? Shadow people, black dogs and now scary ghost pigs. There's gotta be something to that. Or it just makes for a good story. In other farm yard frolics, we have the Phantom Cow of Yerba Buena. So, it's all well and good having stories but where's the evidence? Well, hold on to your socks, here are some real authentic pictures of fluff bird spirits. As long time readers know I'm a sceptical believer. I have seen a shadow person and thus I would be rather unfair to dismiss ghost stories of any sort. But I remain sceptical of the origins of ghosts and believe they are more psychological than real and thus feel I must take all these animal ghost stories with just as much of a pinch of salt as any other. I've yet to be convinced that we humans have an eternal soul, let alone an animal having one! There was once the landlord of a public house who had a pet parrot. The parrot lived in the main room and was much admired by all the regulars. Unfortunately, one day the parrot was chased by a cat the inevitable result was to be expected. The landlord was heart broken. For the following year, the landlord was sure he sometimes heard his parrot talking to him. A year to the day after the parrot died, the landlord was sitting in his establishment after closing time doing the accounts. He looked up and saw the ghost of his dead parrot. "Hello" said the landlord "what are you doing here"
"I'm a parrot who can't rest" replied the parrot "I can't go to parrot heaven and I've been stuck here as a ghost for the past year"
"What's the matter" asks the landlord "can I help?" "Well" replied the parrot "when I met my end my tail came off and I can't go to heaven until my tail is put back on, I've had to carry it with me for the past year. Can you put my tail back on?" "I'm sorry, I can't do that" replied the landlord "it would be against the law"
"Now just why would that be?" asked the ghost parrot. "Well" said the landlord, "This is a licensed pub and it's against the law for me to re-tail spirits after closing time"